But backing up to Friday night, it was Parents' Night Out at our church, which is so nice. But the past two months we have ended the night in Target, shopping for Jack. How does that happen? 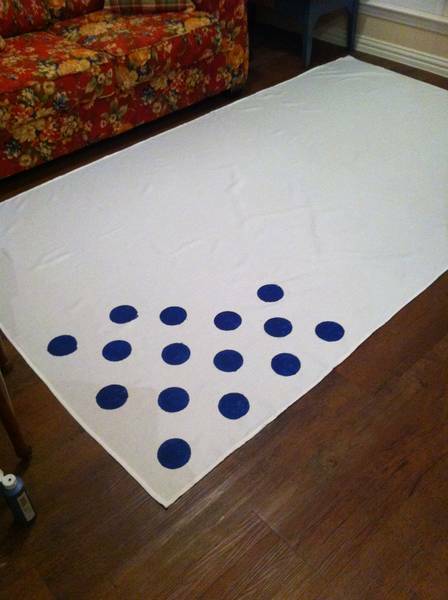 So at some point in the party planning I've been doing over the past few weeks, I decided that I wanted a blue and white tablecloth for my table. Below is what will go down in my file of "Brilliant DIY Ideas Which I Do Not Have the Fortitude to Complete." I think I wouldn't have felt as hopeless over it if I had not chosen a 102" length tablecloth. I would be painting polka-dots in my sleep, plus there is NO WAY I had the patience to line them up. Those were all eye-balled, and who knows what it would've looked like on the far end. And furthermore, (can you tell I am still trying to talk myself out of completing this) the color blue is not "true navy" as the bottle said. And I want navy. It makes me tired just looking at it. And oddly, I feel the urge to play Twister. I LOVE the polka dot table cloth!! And I hate how colors are never the same...when you think your getting navy and you don't, but another brand may really have a navy, but label it midnight blue...MADNESS, ha! Thank you! I think if it were navy I might have finished it. MIGHT. And maybe a couple of feet shorter! Those are the best kind of weekends- slow and unplanned. Good luck finishing up the party plans! I can only imagine how fun that will be! I agree. I love a lazy weekend. I don't know how they get so busy! I'm just reminding myself: this party is for me. Jack will not care what the tablecloth looked like! It looks good! But I agree that it isn't navy and if you want navy then you may be unhappy regardless! Thanks. Plan B should arrive on my doorstep tomorrow. It will be navy. Hello Etsy! The someone-else-DIY website! Maybe you can finish it and use it for another party in the future when you don't have such a deadline. Seriously, girl, I should've gone on Etsy. The only thing is I didn't decide that I needed a tablecloth until last minute. Maybe I just don't need one!